Mechanical engineering is a broad field of engineering that involves converting scientific concepts into real-world applications. Mechanical engineers apply the principles of engineering, physics and materials science to design, develop, and build mechanical devices, often related to the transfer and control of power in dynamic systems, including systems involving sound and vibration. They also perform duties related to the evaluation, installation, operation and maintenance of mechanical systems. Mechanical engineers may be employed in consulting, research and development, manufacturing, transportation, processing, and general-purpose machinery. Some colleges and universities offer cooperative programs in which students gain practical experience while completing their education. Acoustical engineering is a sub-discipline of mechanical engineering and involves the study of sound and vibration. Engineers in this field work to reduce noise and vibration in different mechanical systems and are often involved with the evolution and improvement of acoustical techniques and apparatus. Acoustical engineers are familiar with topics such as sound transmission, interference, absorption, and reflection, and use this information to layout spaces and design devices that will function as intended. This study of acoustics can range from designing a more efficient hearing aid, or recording system, to enhancing the sound quality of an orchestra hall, to quieting the underwater sounds produced by ships.. Engineering acoustics also includes instrumentation for medical diagnosis, communications, and seismic surveying and sonar. Dr. Wilson is an Associate Professor in the Acoustics and Dynamic Systems & Control programs of the Mechanical Engineering Department of the University of Texas, holds the Flour Centennial Teaching Fellowship in Engineering and is jointly appointed as an Associate Research Professor at UT’s Applied Research Laboratories. Wilson obtained the PhD degree in Mechanical Engineering from Boston University in 2001, and the MS and BS degrees in Mechanical Engineering from the University of Texas at Austin, in 1994 and 1990, respectively. 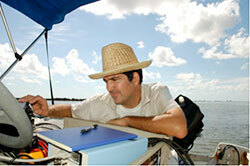 He joined UT’s Cockrell School of Engineering faculty in 2003 after serving as a Post-Doctoral Research Fellow at Boston University, where he studied sound propagation and scattering in bubbly liquids, and the acoustics of water-saturated marine sediments. Previous experience also includes 3 years as a research engineer at Applied Research Laboratories, The University of Texas, 1994-1997, where he studied the acoustics of marine mammal sonar, developed a seismoacoustic mine detection sonar, seismoacoustic vehicle detection sensors and the Combustive Sound Source (a safe and inexpensive alternative to explosive sound sources for use in ocean surveys and seismic prospecting). 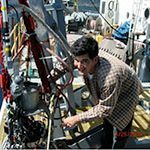 Dr. Wilson’s current research interests are ocean acoustics, physical acoustics and engineering acoustics, with concentrations on sound propagation and scattering in the ocean and in multiphase media, animal bioacoustics, novel acoustic materials and transduction. Wilson also works in the area of underwater anthropogenic noise abatement using large encapsulated bubbles, and is studying the use of acoustics and sonar technology in the fire-fighting environment. Another area of interest is vibration control, focusing on the use of nonlinear systems such as buckled beams and other negative-stiffness-bearing structures.